In this guest post, artist and professor Richard Barlow sheds some light on his artistic process for our upcoming Downtown show, “The Sea of Ice, Receding.” Barlow teaches at Hartwick College in Oneonta, New York. As an artist who makes temporary, site-specific artworks, I am always excited to get a new exhibition opportunity, so I was very pleased to be approached by Philbrook. My recent large-scale drawings are all made with chalk on blackboard paint, directly on the walls of the gallery. These fragile and ephemeral landscape drawings address both existential and environmental concerns. Upon seeing the long, horizontal wall I will be working on at Philbrook Downtown, my mind immediately cast back to my experiences during the Arctic Circle residency, where I spent a month on a sailing ship in the Arctic Ocean. One of the highlights of this trip was sailing to the edge of the pack ice, at which point we could sail no further. The experience of floating at the edge of the ice, with an infinite horizon of sea in one direction and an infinite horizon of ice in the other was truly sublime. It was a melancholy experience, too, realizing that this is the very ice that recedes every year as a result of our ever-heating planet. For the Philbrook exhibition, I intend to make a drawing of this site based on my own photographic documentation. My hope is that this will give viewers an experience similar to mine: an experience of the sublime cut through with melancholy, as they realize that much as the ice is melting away the drawing, too, will soon disappear. See “The Sea of Ice, Receding” at Philbrook Downtown. 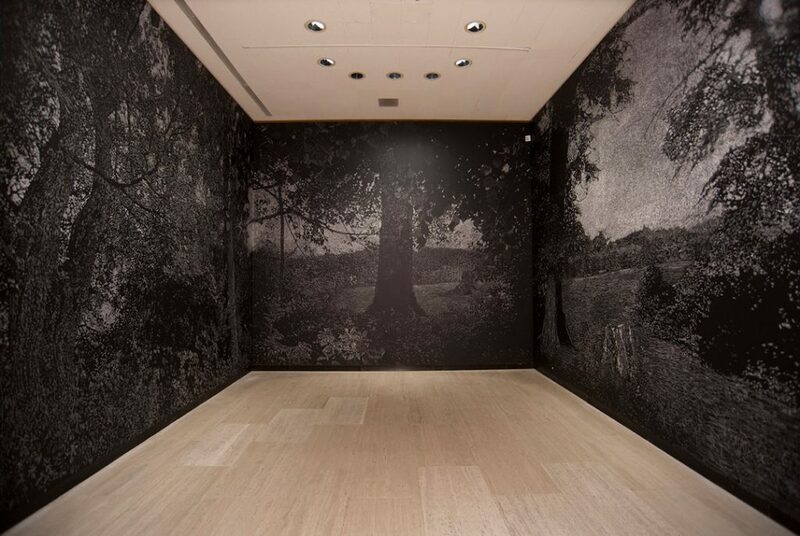 On view Feb 1 – May 19. Richard Barlow, A View of the Copse, 2016. Chalk on blackboard paint, 168 x 852”. Installation Munson Williams Proctor Art Institute. Courtesy of the artist. Richard Barlow, Saturday, June 18, 2016 81º 08.3563 N, 016º10.3649 E Fog Rolling In, 2017. Chalk on blackboard paint, 96 x 492”. Courtesy of the artist.